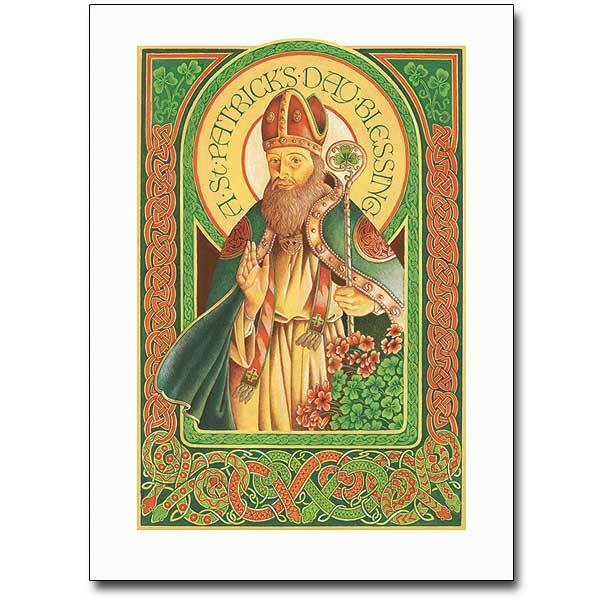 This entry was posted in St. Patrick's Day and tagged Catholic greeting cards, greeting cards, The Printery House on March 17, 2015 by Printery House. Thanksgiving Day will soon be here. Will you be ready? Not just ready with recipes and tablecloths and artful centerpieces – but ready in your heart? Will you be ready to make the day a concert of praise to the Giver of all good gifts? And, beyond that, will you be ready to encourage a sincere Thanksgiving attitude around your holiday table? Here are some suggestions for Thanksgiving traditions that focus on gratitude. One way to stop and thank God for His manifold blessings is to write them down in list form. This year, why not put a pretty piece of paper and a pencil at each place around the table. Tell your guests at the beginning of the meal that this is their opportunity to compose a list of 10 reasons they are thankful. Find small boxes. These can be very simple and very small. The idea is to give one to each person at your Thanksgiving table. Let them know this is their Thank You box to put on their bedside table. Each night before they turn off the light, the gift box will remind them to Thank God for the gifts of the day. Plan at least a few minutes of outdoor time this Thanksgiving. A group walk is even better. Make sure each person finds one reason to Thank God for the glorious earth He has given. Another way to help develop the Thanksgiving attitude is to give each of your guests a box of Thank You cards. We can all be thankful for family, people who love us and those who include us. Those folks should hear from us how thankful we are for them. Catholic greeting cards make it easy to tell others we appreciate them. If you want to tie a page of stamps to each box of Catholic greeting cards it can count as a Christmas gift. If you’ve never browsed through the selection of Thanksgiving cards available at The Printery House then you’ve missed out. Our site offers truly beautiful illuminated cards, cards with a prayer, cards with a psalm or cards with words from traditional Thanksgiving hymnody. We have cute cards, photo cards and cards with scripture. You likely won’t have everyone important to you at your Thanksgiving table – so send them a Thanksgiving card. You’ll be amazed how taking the time to thank people for their contribution to your life will prepare your own heart for sincere thanks on the Big Day. Most guests won’t mind if you take the time to offer a prayer before the Thanksgiving meal. Spend some time composing this prayer. Your prayer could include thanks for loved ones, food and shelter but it could also offer gratitude for our national roots and our spiritual roots as Christians. This Thanksgiving, be prepared. Prepare your own heart by practicing thankfulness ahead of time. Then, help others do the same after Thanksgiving Day. And when you want to send Catholic greeting cards – check out The Printery House online for a wide selection of Thanksgiving cards. This entry was posted in Catholic Greeting Cards and tagged Catholic greeting cards, Thanksgiving ideas, Thanksgiving traditions, The Printery House on November 4, 2014 by admin. calling. October is Clergy appreciation month and while these leaders deserve our prayer and words of gratitude all year long, this month represents a special opportunity to express your appreciation and support. Although members of the Clergy are most visible at the weekly services, church leaders serve their congregations every day, throughout the day. On any given day, pastors and priests may be called upon to pray with someone over the phone, they may be offering counsel in their office, visiting the ill at the hospital or nursing home, performing weddings or funerals, attending potlucks or any number of other church events. These are the leaders who give a public face to the local church. They meet and greet visitors and newcomers. And, as the apostle Paul once said, on top of all of this, they bear responsibility for the church in prayer and oversight. Since October has been designated Clergy Appreciation Month, don’t wait to come up with a plan for letting your pastor or priest know how much you value their work in the Lord. You may have a wonderful idea in mind for how to support your minister, but if you have a hard time coming up with your own ideas, here are a few we thought were helpful. at home or are away at college. It can be a humorous card or one that expresses a serious sentiment, but be sure to communicate to the entire family that you can see how each one is sacrificing for the benefit of the entire church. The pastor may be the person who is up front, but the family behind him shares in the commitment. October is one month of designated appreciation, so why not gather church members and commit to daily prayer and encouragement during this month? You can assign a member to each day or several members to each week. These members pledge to pray on a given day or days for the pastor. You could even solicit specific prayer requests. A gift can be homemade, home-baked or a gift card to a restaurant or store. You could even offer to babysit one evening. Invite your minister and his family (if applicable) over for dinner or dessert. This is a great chance to say in person how thankful you are for his faithful labors. A simple thank you card is worth a lot and you’d be surprised how many people never take the time to pen just a few words. Whether you choose to give a gift or send a Christian greeting card the important thing is to do it sooner rather than later. October will fly past just like every other month of the year. If you are looking for a place to find a Christian greeting card or gift, take a look at The Printery House where you can find anything from stationery to bibles to artwork and more. This entry was posted in Christian Greeting Cards and tagged all occassion cards, any occasion cards, Catholic greeting card, Catholic greeting cards, Christian greeting card, Christian greetng cards, greeting cards, Pastor Appreciation Month, The Printery House on October 15, 2013 by admin. How can you fill your home or office with Christian paintings for less than a latte? Try using the beautiful and faith-filled artwork you find on Christian greeting cards as a source of inspiration. Pinterest and other social media platforms are great sources for ideas for how you can incorporate Christian cards into your home on the walls. This is especially true when the cards feature hand-designed artwork, and in many cases, you can find designs that model great Christian paintings and religious icons. In fact, for years, monks have designed Christian and Catholic artwork or icons that help use their talents to support the work of the monastery. Need ideas for how to incorporate Christian paintings you find on greeting cards? 1. Place a group of them in a collage frame to take up the wall space as a full-sized painting would do. 2. Place Christian greetings cards that depict religious scenes like the birth of Jesus, the resurrection or other pivotal moments behind glass frames and set candles around them for your own custom display. 3. For a child’s room, choose Christian paintings on cards and laminate them for a fun mobile project that the child can help create. Put a verse of scripture on the back of each one. 4. Use a series of images found on Christian greeting cards for telling a story in wallpaper border-style. Adhere them along the top of a room in a repeated pattern for a true conversation piece that talks about your faith. The Printery House still makes greeting cards in-house with artistic lettering and design work by monks who live at Conception Abbey, a Benedictine monastery in the rolling hills of northwest Missouri. The cards have been designed and printed on the grounds of The Printery House for 60 years, so there’s something truly special about these pieces of Christian artwork. They truly are works of art that you can treasure for years to come. To start your own home collection, try the Keepsake Prayer Cards, featuring intricate and beautiful designs. You may also want to experiment with the artistic styles on the Mass Cards, which range from contemporary to traditional images. The Icon Greeting Cards collection features bright and highly-detailed designs, including the Trinity, angels and the Last Supper. Selecting these unique, locally-made designs is a meaningful way to incorporate the concept of Christian paintings into your home without a large investment. This entry was posted in Christian Paintings and tagged all occassion cards, Catholic greeting cards, Catholic paintings, Catholic wall art, Christian greeting cards, Christian paintings, Christian wall art, The Printery House on July 30, 2013 by admin.